Recently I came across a quote by the iconic, Coco Chanel – "In order to be irreplaceable, one must always be different". It got me thinking that, although we all know the name Chanel and are familiar with the "brand", what do we really know about the woman? Well in my case, the answer was – nothing! So, I decided to do some reading and find out a little about the person behind the iconic name. 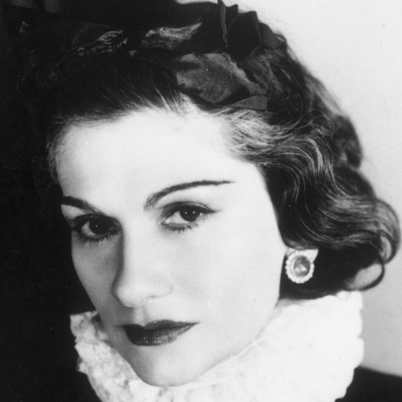 Gabrielle "Coco" Bonheur Chanel was born in 1883. Her mother was a laundrywoman in a hospital and her father was a street vendor. When she was twelve, Coco was sent to live at a convent. She stayed there until she was 18, and was then moved to a boarding house. Apparently, after Coco found fame, she was known to make up elaborate stories about her upbringing, as she didn't like the truth about her past to be public knowledge. It was at the convent that Coco learnt to sew, and eventually was able to get work as a seamstress. She also sang in a cabaret, which is where she became known as "Coco", rather than Gabrielle. 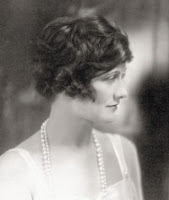 Chanel's first boutiques were financed by Arthur Capel – a man she had a long-term love affair with. In 1910 she became a hat maker and opened a small boutique in Paris called Chanel Modes. Coco's career started to grow once a famous theatre actress started modelling her hat designs. In 1913 she went on to open another boutique, where she introduced a casual line of clothing. Then she opened another establishment in 1915 at a different location. By 1916, Coco was able to reimburse Arthur Capel the money he had invested in her and by 1927, she owned five properties on the famous rue Cambon. Here she went on to expand her line to feature jewellery, cosmetics and of course fragrance. Over the years to follow, Chanel went on to design for film and made personal clients of actresses such as Greta Garbo and Marlene Dietrich. It was said though, that Coco didn't think much of Hollywood. Later in life, after the war – and a lot of controversy surrounding her alleged involvement with the Nazi's - Chanel moved to Switzerland, but returned to Paris in 1954 where she then stayed. In early 1971, Coco passed away in her sleep at the age of 87. She never married or had children. However, she certainly left behind a legacy with her clothing, bags, fragrance and cosmetics still being as popular and as sort after as ever. I find it so interesting to take the time to look back on someone's history and find out a little more about who they were as a person. From my understanding, Coco Chanel was a strong, confident, intelligent and hard-working woman, who has truly left her mark on us all.